So to start, let’s set the record straight…The answer to the questions above is ‘no’. Cannabis is a plant family that includes many species, including sativa, indica, and ruderalis. Marijuana is technically an alternate name for the cannabis plant, most often used to refer to a preparation of the drug. Marijuana consists of the dried leaves and stems of the cannabis plant and tends to be higher in THC levels. This distinction is especially important if you are looking to buy the best cannabis products. Products made from industrial hemp vs. marijuana have greatly different cannabinoid profiles and legal ramifications. Cannabis plants have been cultivated and harvested by humans for thousands of years. 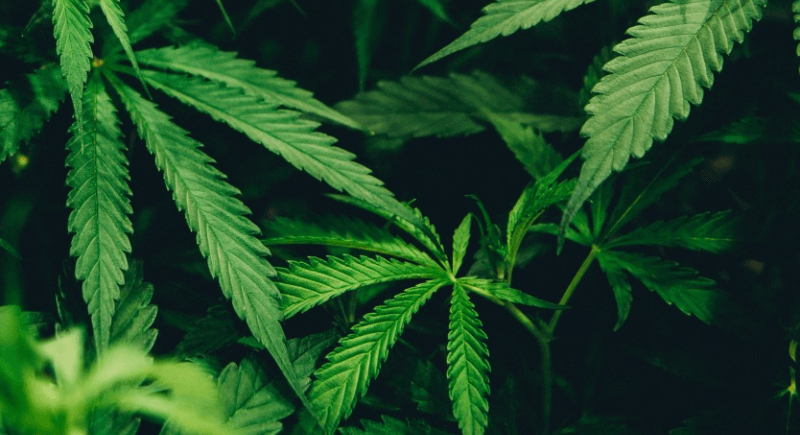 The cannabis plant family includes many different plant types, but none is as controversial (and undeservingly infamous) as marijuana. Marijuana (or cannabis sativa by its Latin name) is a bushy, short plant particularly loved for its sticky glands. These glands are called trichomes, and they produce THC (tetrahydrocannabinol). THC is a psychotropic substance responsible for giving marijuana users a “stoned” feeling (also known as a high). Aside from marijuana, there is also the amazing hemp plant. Hemp is the humble, less-known cousin of marijuana. Hemp can grow to be very tall and is used mostly for industrial purposes. The fibers of hemp trees are very tough, and the oil made from hemp seeds has many uses. So…hemp oil and marijuana oil: Are they the same thing? How do these two types of cannabis oil differ? These two oils get their names from the plants they’re extracted from. 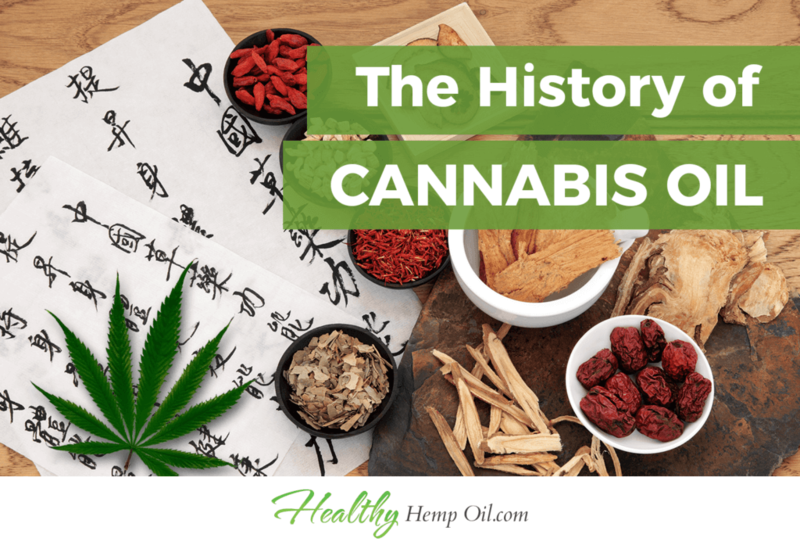 So let’s take a look at the similarities and differences of the plants to get a foothold in the hemp oil vs. marijuana oil story. 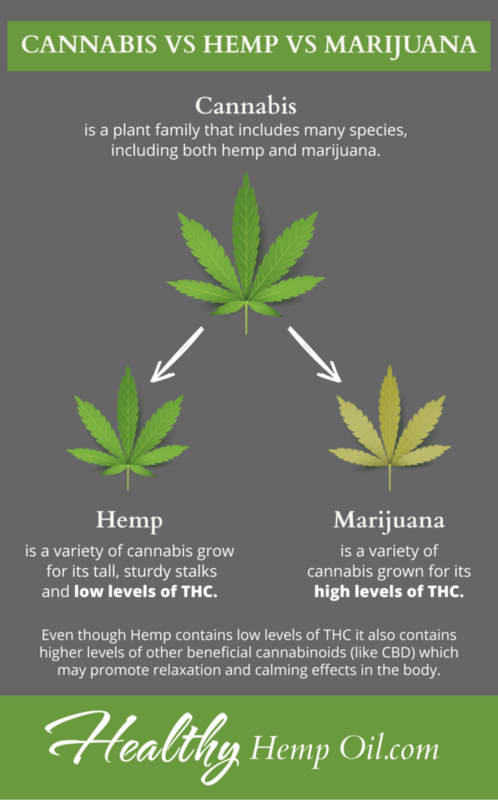 We know that hemp and marijuana are not completely different plants. They are varieties of the same species: the cannabis plant family. We also know the two varieties have several significant differences. These range from how they grow and look to how they are used and the chemical compounds in their extractions. For instance, hemp grows up to 15 feet tall with long, massive stalks. Marijuana grows outward with more leaves and buds and rarely exceeds five feet tall. Industrial hemp plants also seem to grow comfortably closely packed together while each marijuana plant requires some space to grow. There are close to 400 cannabinoids in both cannabis and hemp. The two that stand out most are tetrahydrocannabinol (THC) and cannabidiol (CBD). These are the most active and studied cannabinoids. Understanding these two cannabinoids is the key to making the right decision when it comes to choosing between marijuana and hemp oils. THC is responsible for giving a high or “stoned” feeling. It is the part of cannabis that has given the whole plant an undeserved “bad name” around the world. The oil extracted from hemp and marijuana plants contains both THC and CBD. The difference is in how much. Marijuana is usually made up of 5-10% THC, so people consuming marijuana products are likely to have a high. Marijuana is mostly used for recreation, but it’s been recently allowed for medicinal use. On the other hand, hemp oil contains less than 2% THC but has a high concentration of CBD. This makes it ideal for relaxation without any psychotropic effects. Those are the differences between hemp and marijuana oils. Now, let’s look more closely at each on its own. In short, marijuana oil is a liquid produced by extracting THC from marijuana buds using a solvent. The buds release their fat-soluble compounds (including cannabinoids like THC and CBD) into the solvent. Finally, the mixture is boiled down into marijuana oil. This type of cannabis oil contains a high amount of THC as well as the other beneficial cannabinoids found in marijuana. The extraction is a long process and should be done carefully, using only high-quality marijuana buds and a good solvent. It is possible to make your own hash oil if you know how. Some available marijuana oils are Rick Simpson Oil, Black Oil, and Phoenix Tears. Hemp oil is made from the seeds and stalks of the hemp plant. The seeds are pressed until the oil comes out. When it comes to the health benefits of cannabis oil, hemp and marijuana oil are quite different in some aspects and similar in others. We’ll look at each of them alone. In the last decades (since the 1970s), scientists have made immense progress in discovering the many health benefits of marijuana oil. Despite the psychotropic effects for which the plant has been abused, marijuana oil has been proven to soothe nausea, improve appetite, help chemo patients feel better, and ease the pain of seriously ill individuals. Increased Appetite: Marijuana oil was cited in a 2007 study to increase the appetite of anorexia patients and patients suffering from nausea. Health Improvement in Asthma Sufferers: Inhaling marijuana vapors has been shown to improve air conductivity in the lungs, making it a promising future treatment for asthma. It mainly works as a bronchodilator. Reduced Stress: Long-term studies on war veterans have shown that marijuana can reduce the effects of PTSD. Another study suggested that marijuana can reduce anxiety and fear. Pain Reduction: Marijuana can reduce physical pain. A single dose has been shown to reduce pain levels in people suffering from post-surgical neuropathic pain. Improved Sleep: Since marijuana has been shown to reduce stress and pain, it can help certain individuals sleep better thanks to the relaxation and comfort it provides. More Benefits Still Being Studied: Many studies are underway on whether marijuana can be a successful treatment for certain types of cancer, Alzheimer’s disease, multiple sclerosis and other serious ailments. Lab results have sometimes been promising, but there are no definite results yet. It remains to be seen what other ailments marijuana will address in the future. Better Sleep: CBD has a mild relaxing effect that can help you fall asleep easier at night, without causing drowsiness. Reduced Stress: CBD gives an overall sense of comfort that helps people wind down and recharge after a difficult day. Decreased Inflammation: CBD has been shown to naturally help against inflammation, increasing general well-being. Improved Quality of Life: A daily serving of CBD offers a general sense of euphoria without any of the psychotropic effects of marijuana. As with most beneficial substances, cannabis oil does come with its side effects. Hemp oil and marijuana differ significantly in this respect, so, once again, we’ll look at them both separately. When used at a young age, marijuana may alter brain function. It is not advised to take marijuana under the age of 18 unless a physician advises otherwise. Adults who use marijuana may experience slightly reduced memory function and a lowered ability to think, concentrate, and learn while the THC is active. Marijuana should never be mixed with other medication without asking your physician first. If you are pregnant or breastfeeding, you should not take any marijuana products to avoid endangering your child. You should NOT drive or work with heavy machinery or dangerous tools while under the influence of THC. Despite these side effects, marijuana is a generally safe and very rarely causes complications when used under the guidance of a medical professional. You can actually make your own cannabis oil at home if you know how. It is very important to follow a clear and safe recipe. Oils are combustible, so safety can be an issue, and you also want the resulting product to be potent and high-quality. First, prepare your countertop, and make sure everything is clean. Place your marijuana in the glass bowl, and add clear alcohol until the buds are completely covered. Stir with the wooden spoon for a few minutes to release the THC into the alcohol. Use the cheesecloth to strain the cannabis-alcohol into the mixing container. Repeat step 1 with the strained buds once more to get as much THC as you can out of your marijuana. Use the double boiler. Place water in the lower pan and the cannabis-alcohol in the upper pan. Cook until all the solvent has evaporated and only a sticky brown oil remains. Scrape that oil onto your parchment/baking paper. Fill the oral syringes with the ready marijuana oil. Remember: Make sure to do step 4 in a well-ventilated room or outdoors. Sadly, making hemp seed oil at home is very difficult. Properly extracting the oil from the hemp seeds requires heavy-duty equipment. There currently is no recommended DIY solution. We recommend you simply order your hemp oil online from a trusted provider like Healthy Hemp Oil. How you ingest cannabis oil depends on the type. Each cannabis oil is a bit different, so let’s take a closer look. If you’re looking to make some delicious baked marijuana goodies, cannabis oil is the way to go. The oil form is also preferred for children who need to take medicinal marijuana, for those who don’t like smoking, and for anyone with a pre-existing respiratory condition. Marijuana oil takes a bit longer to work than smoking but can offer just as much of a high. The THC content depends on what kind of marijuana buds were used to make the oil. Medicinal marijuana is usually ingested using syringe applicators or self-filled capsules. If you’re taking marijuana oil for medical reasons, make sure to follow your doctor’s instructions. If you’re unwilling or unable to make your own marijuana oil, you can get it from your local dispensary either in capsule form or in syringes. Hemp oil can be ingested as is if you like its distinct nutty flavor. This method ensures that you get a steady, strong serving every time. There are also many different CBD oil-infused treats, including chocolates, candies, lozenges and chewy toffees. These are great if you prefer to take your hemp oil in the form of a sweet treat. You can also create your own CBD oil treat by baking or cooking goodies and adding hemp oil to the recipes. Some people “smoke” hemp oil by putting it in vape pens. Vaping hemp oil is much healthier than smoking, since there is no actual burning going on. You simply inhale the hemp oil-infused vapors. Vaping also gives you faster results than eating hemp oil. When it comes to hemp oil, there are many fun and pleasant ways to get your daily serving. Simple CBD Oils: This is the simplest form of CBD oil, also known as raw oils, for when you want a simple hemp product. You can also get them in concentrates that contain more CBD in less liquid. Capsules: Great for when you want a very specific or stronger serving of CBD. Also good if you want your hemp oil to be flavorless and easier to take. Hemp Spray: A fun little bottle of CBD oil that you can spray directly on your tongue and enjoy. This CBD Oil Herbal Spray is a great example. CBD Chews: These lovely chewy candies are delicious treats. Vape Oils: These are perfect to use in vape pens. They come in many exotic flavors or in a simple hemp flavor. Vape Additives: You can add these to your favorite vaping liquid to infuse them with healthy CBD. CBD Topicals: Skin creams and shampoos are meant for external use only, offering a soothing, gentle experience. Hemp Chocolates: If you love chocolate and, hemp then these amazing hemp-infused artisan chocolates will become your new favorite treat. CBD Lozenges: Tasty lozenges will keep your breath smelling fresh while also giving you your daily CBD serving. As you can see, you have plenty of amazing options when it comes to choosing the perfect CBD product for you. When it comes to buying your own cannabis oil, check out the current laws and requirements in your state. Illinois: Medical use is legal. Selling and cultivating are legal for medical use only. Indiana: Medical use of cannabis oil is allowed. Selling is legal for medical use only. Kansas: Medical use of cannabis oil is allowed. Kentucky: Medical use of cannabis oil is allowed. Maryland:Decriminalized for possession of under 10 g. Medical use is allowed. Selling and cultivating are legal for medical use only. Michigan:Medical and recreational use are legal. Cultivating (up to 12 plants per household) is legal. Minnesota:Decriminalized. Medical use is legal. Selling is allowed for medical use. Cultivation is illegal. Mississippi:Decriminalized if found in possession of less than 30 g. Medical use of cannabis oil is legal. Illegal to sell and cultivate. Missouri:Decriminalized. Medical use is legal. Cultivation is legal for medical use. Nevada:Medical and recreational use are legal. Cultivating and selling (to an extent) are legal. New Mexico: Decriminalized.Medical use of cannabis oil is allowed. Selling and cultivating are legal for medical use only. New York: Decriminalized if not in open view. Medical use is legal. Selling and cultivating are misdemeanors. North Carolina: Decriminalized for 0.5 oz or less. Medical use of CBD oil is allowed. Illegal to sell or cultivate. Ohio: Decriminalized (civil infraction). Medical use is legal. Legal to sell for medicinal use. Illegal to cultivate. Oklahoma: Medical use of cannabis oil is allowed. Selling and cultivating is legal with a medicinal license. Oregon: Recreational and medicinal use are legal. Selling and cultivating (with some limitations) are legal. South Carolina: Misdemeanor. Medical use of cannabis oil is legal. Selling and cultivating are illegal. Tennessee: Misdemeanor. Medical use of cannabis oil is legal. Selling is a felony. Texas: Illegal. Medical use of cannabis oil is allowed. Selling is a felony. Cultivating is illegal. Vermont: Recreational and medical use are legal. Selling and cultivating for medicinal use are legal. Washington: Recreational and medical use are legal. Selling and cultivating are legal with restrictions and licensing. Wisconsin: Medical use of cannabis oil is allowed. Selling and cultivating are felonies. Wyoming: Possession is a misdemeanor. Medical use of cannabis oil is allowed. Selling and cultivating are illegal. Washington, D.C.: Recreational and medical use are legal. Cultivation is allowed only for personal use. Selling for medicinal use is legal. If you’re looking for cannabis oil, but it isn’t legal to possess in your state, you can get industrial hemp oil instead. We at Healthy Hemp Oil are a legal and authorized hemp oil seller, so, when you buy your CBD oil from us, you know that it is safe, potent, legal and of the highest quality. Does Hemp Oil Contain THC? Yes, hemp oil contains tiny traces of THC. The amount is so small, though, that you won’t get any of the effects of THC. Hemp oil won’t get you high or cause any psychotropic effects. Hemp is a plant in the cannabis family. Cannabis is a plant family that includes many species, including both hemp and marijuana. Marijuana is a short, bushy plant with buds that contain around 10-20% THC. Hemp is a tall plant that contains very little THC but has a lot of CBD in its seeds and stalks. No. When people say “cannabis oil,” they usually mean marijuana oil. Although hemp oil is a type of cannabis oil, what is usually sold as cannabis oil is not the same. Usually, oil marketed as “cannabis oil” is rich in THC and will give you a high. Hemp oil contains little THC and won’t give you a high. No. Although both weed (a.k.a. marijuana) and hemp belong to the same plant family, they have been bred to be quite different. Hemp has been cultivated to produce tough fibers and nutritional oil while weed is cultivated mostly for its psychotropic effects and medicinal use. Marijuana wax is a non-transparent marijuana extract that is solid and opaque. The wax can be gooey (budder) or brittle (like a honeycomb). The main difference is that marijuana oil (cannabis oil) gets you high, and hemp oil doesn’t. Cannabis oil (marijuana oil) is rich in THC while hemp oil is very low in THC and high in CBD. If you have any more questions concerning cannabis oil and the differences between hemp and marijuana, please leave us a comment below!